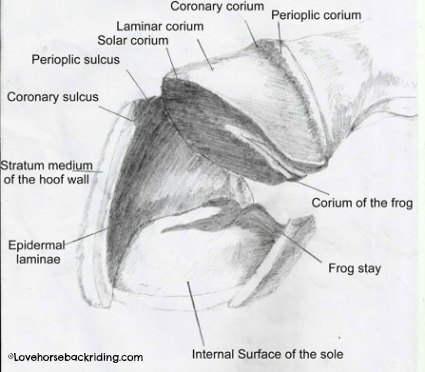 Horse hoof anatomy is complex. 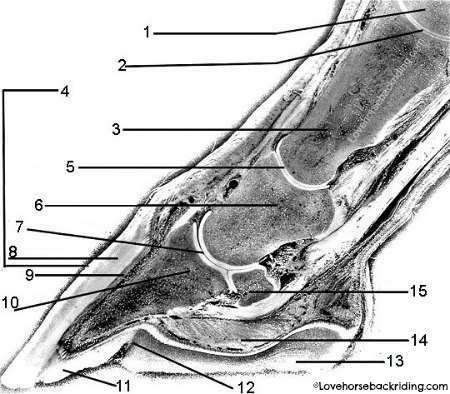 There are many structures within the hoof including bone, cartilage, bursa, ligaments and cushioning. All these structures work together to absorb shock, bear weight, resist wear, provide traction, and assist in pumping blood. There is a saying that says "No hoof, no horse." It's true. The foot is the foundation of the horse. Without this vital structure in tact, problems and diseases of all sorts can arise and wreck havoc on your riding plans. One bad foot injury can leave a horse lame for months. Other diseases can leave him permanently lame. First you will find a picture that is the more outer layers of the hoof. If you have handled equine feet before, you'll probably recognize some things. This is a picture of the bottom outer layers in horse hoof anatomy. On the left you will see the outer most or superficial part of the foot. Central Sulcus of the Frog - A sulcus is a depression or natural division. In the frog anatomy it is referring to the the depression between the two sides of the frog. The frog is the v-shaped structure. If you need some basic refreshers of hoof parts go here. Collateral Sulcus - This is a depression to the side, or a secondary sulcus. Body of the Sole - The main part of the sole or bottom of the foot is arched and is mainly for protection. Stratum Medium of the Hoof Wall - The wall is the main part that bears weight. It grows downward from the coronary band at an average of 3/8" per month. White Line - A buffer between the movements of the sole and the wall of the foot. 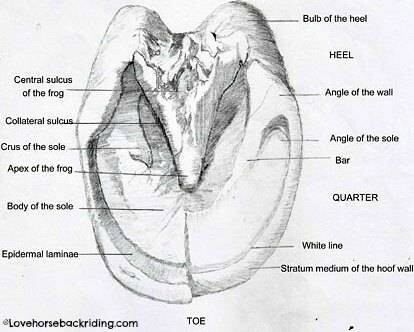 Heel, Quarters, and Toe - Shows the corresponding anatomy named as such. The toe is located at the front, for example. This view of anatomy from the side of a leg cut into half is to show you the inner structure of the foot and a bit into the leg. 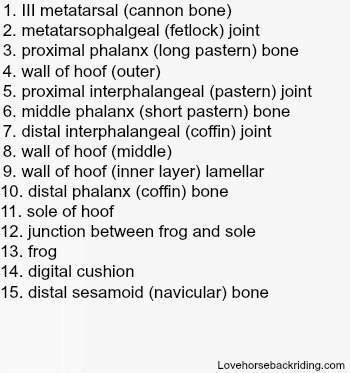 You can see the different layers of the hoof wall as well as the bones of the leg and foot. This is a back leg. You can see that from the naming, where it says metatarsal, that refers to tarsus, or the hock indicating a back leg. Note #14- This wedge shaped structure is fibro-fatty. It is very elastic but has very few nerves and blood vessels and compresses to cushion the bones and absorb shock. The idea in this horse hoof anatomy picture is to illustrate the concept of sensitive and non-sensitive structures of the foot. The sensitive structures and anatomy are generally located more internally (toward the center) provide nourishment which in turn promotes growth. They are rich in blood supply and nerves. Any injury to this area is extremely painful. The non-sensitive structures such as the wall are the reason that horses can wear shoes. The shoes are nailed through the non-sensitive areas. These parts are tough and don't have many nerves. It is almost like our own fingernails. You don't feel much in them until one gets ripped too short, which then gets into the sensitive connecting structures. Same goes for the horse.